But should you be on the fence between pirates and ninjas, Captain Jack’s now has your back as well. Their new “Singapore Pirate Hat” boasts a strong asian influence that’s sure to turn heads in pirate and ninja circles alike. Made entirely of asian seagrass, folded into a distinctly oriental shape, and punctuated with a small feather assortment attached with an antiqued pin, this is certainly a hat like no other. 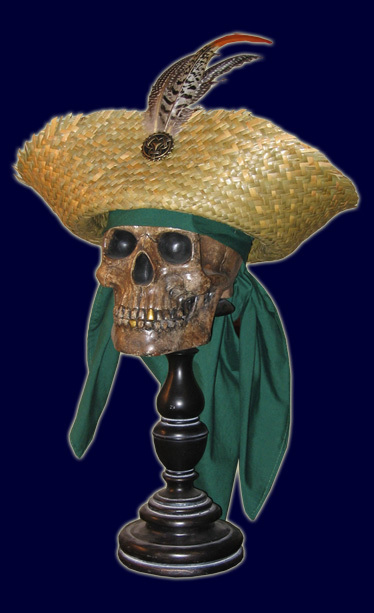 The festivals are full of Caribbean pirates sporting tricorns. Be bold – wear a Singapore hat to stand from the crowd and tell the world that you’re strong enough to bear a musket, yet nimble enough to pluck the coin purse from a Dutchman with a pair of chopsticks. This entry was posted in Clothing and tagged captain jack's pirate hats, hats, pirate trading company by Bilgemunky. Bookmark the permalink. Yaaaar! I have to admit I was a bit apprehensive about spending this much money on a dome cover. In the end I saved the money and went for the Filibuster ($140) oil/wax treated. After getting the hat a few days ago (waited for six weeks), I am completely satisfied. True, it’s a big chunk o’ coin but if you spend the little extra for the finish, it’s a great investment of good times. From time to time he will also have discount hats that are… well… a bit off. Usually at greatly reduced prices and if you’re just a pirate that isn’t trying to look perfect, it’s a good deal.